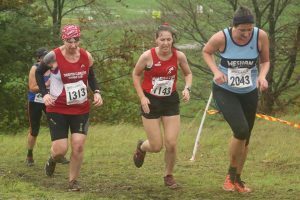 The Mid-Lancs Cross Country League season opened where it left off, at the new venue at Glaxo in Ulverston but the conditions on this second weekend in October could not have been different from the previous occasion on the first weekend in March. The dry and biting conditions in the spring were replaced with a torrential drenching now in the autumn and on the same course it was awash with mud and slippery conditions especially on the several switch-back sections up and down the banks surrounding the cricket field. Wesham started off the season with a squad reduced by a team jolly to Palma but there were very encouraging shoots with some excellent performances from new team members and the old hands. In the Senior Women’s 2.5-lap 6.4km course Wesham just had 3 runners, enough for a team, and Anne Mayers-Smith lead the way with a great run to come in 54th and 15th W35 in a time of 34:13. Kath Hoyer ran well to place 4th W55 and 62nd overall in 34:59, and stalwart Jenn Thompson finished 111th and 33rd W35 in 39:53. This gave the Wesham ladies 24th team place overall, and 14th W35 team. Accompanying the women on the 6.4km course were the men Over-70, and the Wesham ranks were swelled this season to ultimate effect. Dave Young returned to cross country after a couple of seasons absence and he ran very well to finish 2nd in 37:06. Peter Bartlett similarly returning to the grassland was close behind in 3rd place in 37:35. Dave Waywell closed the team in 5th place with his time of 41:43 and the Wesham team took the gold position. In the Men’s 4-lap 9.1km Wesham had 9 runners, with debutant Andrew Harling having a great run to come in 65th in 40:21. Mark Bellfield also running his first cross country finished 92nd in 42:06. Thomas Crabtree another first timer for Wesham placed 105th with 42:48, and Matty Chamberlain was Wesham’s first placed masters’ finisher as 28th M40 in 43:35. John Collier was recorded as 8th M60 in 174th place in 47:07; Dave Marsland 15th M60 and 203rd overall; Phil Leaver 222nd and 20th M60 in 54:22; and Ben Wrigley a top effort in 225th place with 54:41. Missed off the results was Phil Quibell, who came in around 40th – 45th place in around 39 minutes. The Wesham men’s team were given 15th place; the M40s were 15th (Chamberlain; Collier; Marsland; Leaver); the M50 team were 11th (Collier; Marsland; Leaver) and the M60 team 2nd (Collier; Marsland; Leaver), although the inclusion of Quibell will alter these positions and give Wesham the M60 team win. The other big event of the week took Wesham members away from the UK as sun seekers to Palma, capital of Mallorca off the eastern coast of Spain. Here there was the annual festival of road racing, and Wesham had a relative army of athletes running in the 10k and Half Marathon. Heading the team in the 10k Simon Denye had a storming run in temperatures in the high 20s to finish 11th with an excellent time of 36:33 and placing 2nd M45. Lee Barlow followed up with a round 40:00 for 41st place and 6th M45, and Carl Groome 41:56 for 65th place and 9th M45. Nigel Shepherd had a great run to win the M60 category in 43:18, 93rd overall. Peter Cruse was right behind in 95th place with 43:27 for 4th M55. Carmel Sullivan excelled coming in 1st W50 and 15th woman in 45:22, 129th overall. Sharon Cooper finished 51st woman and 12th W45 in 50:30, 299th overall. Tracey Hulme was 4th W55 and 54th woman in 51:00, 319th overall. There was no published women’s team list, but for Wesham Kerry Eccles was next in 128th place and 6th W55 in 56:18, in 568th position overall. Louisa Denye was 28th W40 and 155th woman in 57:16, 637th overall. Lisa Whitlock was 160th and 20th W50 in 57:26, 649th place; Tanya Barlow 228th and 54th W45 in 59:50, 829th; Joanne Shepherd 1223rd in 1:03:58; Maureen Danson 491st with 1:05:05 (1331st); Julie Rooney 492nd in 1:05:07 (1332nd); Caz Wadsworth 1304th in 1:25:07 (2594th); Sue Rigby 1305th in 1:25:08 (2595th); and Julie Topping 2594th in 1:25:08. For the men Rob Wallace finished 174th in 46:28; George Kennedy 216th in 48:30 (6th M60); Stuart Topping 273rd (50:00); James Danson 52:54 (410th); Steve Myerscough 650th in 57:27; and Peter Rooney 736th in 58:32. The Wesham men finished 3rd team. In the Half Marathon Steve Littler finished 1st M45 and 12th overall with an excellent run in 1:17:53 having gone through 10k in 35:51. Helen Lawrenson finished 90th woman and 14th W45 in 1:49:04 placing 625th overall. Graham Brook was 2251st in 2:14:53 (253rd M50); Heather Buckel 1006th woman and 3136th with 2:28:48; and Debbie Myerscough was 88th W55, 1007th woman and 3137th also 2:28:48. 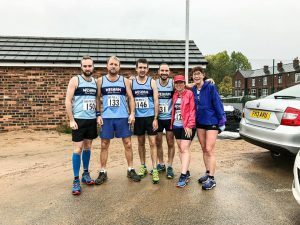 Nearer to home there were 6 Wesham runners in the Gin Pit 5 race in Tyldesley in the club Trail Championships. David Taylor finished 5th in the two-lap figure-of-eight course in a time of 31:18 for the 5 miles. Paul Gregory steamed through to take 8th place in 31:52 and placed 2nd M40. Steven Gore was 24th in 34:15 and Elliot Costello 65th in 37:42. Kath Hoyer took on her second off-road 5-miler after the excesses of the Mid Lancs the previous day and she finished 2nd W55 and 22nd woman in 41:31, 102nd overall. Vicky Gore was 39th woman and 7th W40 in 46:50, 135th overall. Jason Blagden finished 7th in the Helvellyn Trail Challenge, second par to the main Trail Race, clocking 1:12:31 for the 12k of running in atrocious conditions with much of the course turned to water courses. Finlay McCalman ran the 10k and he finished 161st in 1:10:57. There was also the Manchester Half Marathon run in good conditions on Sunday morning. In a good quality race James Mulvany was 10th M40 and 74th overall in 1:17:24 in a race won by international road and country champion Andy Vernon. Paul Lancashire ran a personal best time in 1:36:43 to finish 1089th, with Stuart Layton also running his best time in 1:39:08 for 1378th place. David Millar finished 4018th with 1:54:37 and Catherine Nicholls was 1484th woman and 5721th overall in 2:03:35. Paul Carter ran his 5th marathon of 2018 at the Yorkshire Marathon in York; he finished 3874th in 5:30:52. Jonathon Sanderson ran the Alder Hey 10k and he finished 170th in 47:08. In Blackpool Liz Johnson ran the Autumn Breaker 10k in 52:17 and Heather Bradley ran 1:09:27 for 300th place. Lytham Hall parkrun was cancelled due to the extreme weather so Wesham members travelled to neighbouring events. In the Preston parkrun Robert Brown ran 26:56 for an M60 age graded performance percentage of 60.09%. Chris Pike ran St Helens Victoria Park in 25:45 for an M40 grade of 54.24%. In the Witton parkrun David Taylor scored the 2nd fastest time of the morning with 20:11 for 64.41% on the undulating and twisting course. Steven Gore was 4th fastest with 22:09 for M35 60.27%. Vicky Gore ran 30:47 for W40 50.35%. Emma Lund popped up at Lancaster Williamson Park to run 23:41 for W35 63.12%. In Blackpool Stanley Park Graham Cunliffe clocked 26:18 for an M60 grade of 62.04% while Dave Marsland warmed up for the Mid Lancs cross country with 27:06 for M60 60.21%. Debbie Bell ran 38:12 for W45 41.58%. Mark Renshall zipped off a swift 20:08 for the 3rd fastest time of the day and M45 age-graded 70.45%.